Noah Rubin, an 18-year-old from Rockville Centre, N.Y., clinched the boy’s singles tennis title at Wimbledon tennis tournament on Sunday afternoon, July 6. Ranked 539 in the world, Rubin took the title after besting his compatriot – and good friend – Stefan Kozlov in a thrilling three-set match (6-4, 4-6, 6-3). It was the first Grand Slam final for Rubin, who he described his moment of victory as ‘almost surreal’. He embraced Kozlov at the net, and his father – who was weeping – courtside. Noah Rubin raises his Wimbledon trophy. “It’s almost surreal to be called a Wimbledon champion, hopefully it will kick in over the next few days. It’s just great to be here in front of you all, but right now I just don’t want to cramp in front of you guys!” said Rubin following his epic win. With his father by his side, Rubin shared his special moment with his family back home. “I’ve been in touch with my grandparents, my coach, my girlfriend, my mom,” he reported. Having taken the first set in little over half an hour, the second set proved to be a rollercoaster of an affair. Falling 0-2 behind early on, he then broke back twice to find himself serving for a 4-2 lead, only to see Kozlov show his battling skills, before tying the match up. The third and final set was tied at 3-3 when Rubin broke serve. He then held his serve to move ahead 5-3, before breaking again to win the match 6-3. Noah Rubin with his dad and coach, Eric Rubin. His success, he said, was all a matter of attitude, coupled with his experiences over the past year. Next up for Rubin: “I get home and I have a week off before I have a Future – the lowest level of men’s professional tennis tournaments – in America in Godfrey, the atmosphere there will be a little different, and then I’m off to Kalamazoo. Next up for Rubin is college. 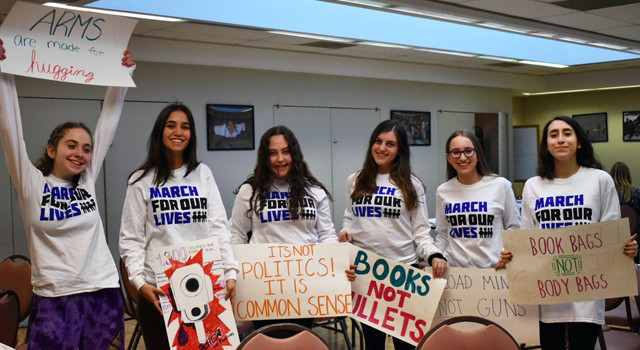 Connecticut Teens ‘March for Our Lives’ in Washington, D.C.